You know those little schedule cards that show your favorite sports team’s schedule? The ones that you can put in your wallet? 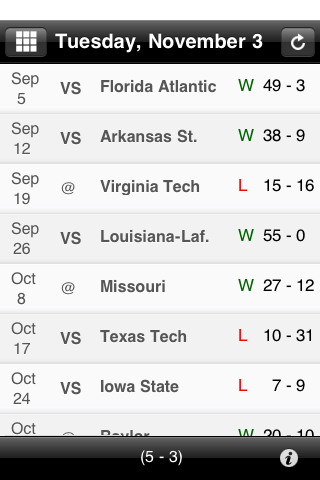 Well, back in February of 2009 I didn’t have one, but I figured it would be nice to have the Husker’s schedule on my iPhone. Nebraska Fan was born. I believe that if you can create a solution to your own problem, then chances are you are solving someone else’s problem. It turns out that 150,000 people agree with me. Plus, solving your own problem may be one of the easiest ways to enter into business. All you have to do is slap a price tag on your solution. What problems do you have? Is there a solution that you can come up with? Even better, can you automate that solution?